The Deputy Chief Minister of Penang state in Malaysia Professor P. Ramasamy, who is a long time advocate of the rights of Eezham Tamils, on Wednesday condemned the Malaysian Ceylonese Congress (MCC) for inviting the SL High Commissioner to Malaysia to grace a biennial dinner, which is being organised on November 25, 2017. The Chief Minister of Penang has also been invited to deliver a keynote address at the dinner. “I am not sure whether the Chief Minister of Penang would be accepting this invitation. However since the Penang state government has taken a strong stand against the Sri Lankan government for its abuse of human rights among Tamils, it is unlikely that he will attend,” the Deputy CM said. “It is a terrible shame that the members of the MCC have no feelings towards the sufferings of Tamils” in the island from which they emigrated during the times of British colonisation, Professor Ramasamy said. “This is not an ordinary invitation for dinner,” he said. “Such an invitation to Sri Lankan official would gives the impression that that the government there has played its part in restoring normalcy to affected Tamil areas due to civil war,” Professor Ramasamy added. The Deputy Chief Minister is a former professor of politics at the University of Malaysia. 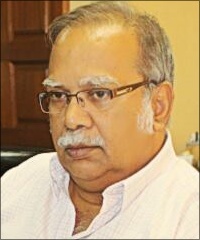 He participated as a member of Eezham Tamils Constitutional Affairs Committee during the internationally mediated talks between the LTTE and the GoSL and was instrumental in working out the blueprint of the proposals for an Interim Administration for the Northeast (ISGA) along with other Tamil legal experts in 2003. “The reality is that hundreds and thousands of Tamils have not returned to their homes. In the north, the Sri Lankan army continues to occupy houses belonging to Tamils. “Individuals and families disappeared during the civil war have not been accounted for. “To date, despite international outcry, human rights abuses amounting to genocide have yet to be investigated and perpetrators brought to justice. “Given this situation in Sri Lanka it is completely irresponsible for MCC to work closely with the Sri Lankan government or even think of inviting its officials to participate in their functions. 06.10.15 Tamils need leadership, not hypocrisy of powers: Prof Ramasa..
15.11.14 Penang conference demands IC to end SL military occupation, ..
02.02.14 London conference explores nature of land grabs in Tamil hom..
27.09.13 Navi Pillay's oral update, a gross betrayal of Tamils: Prof ..
30.10.10 Eelam war damaged India’s reputation: Pinang Deputy Chief Mi..
12.08.10 Malaysian Tamil leader hard on Sri Lanka’s abetters, urges b..
08.07.10 Malaysian corporate brokers embark on ‘development’ in Jaffn..
27.06.10 Malaysian corporates jump at Mahinda-KP plot for development..
16.06.10 Political transformation should start in Tamil Nadu: Prof Ra..
13.11.17 Factoring political solution more important than a..
08.11.17 MCC should not insult Tamils by inviting ‘Sri Lank..